NEW YORK (CNNMoney.com) -- New York Attorney General Andrew Cuomo said Thursday it was bringing civil charges against senior Bank of America executives, including former company CEO Ken Lewis, for their role in the company's controversial purchase of Merrill Lynch. Separately, the Securities and Exchange Commission said it had struck a $150 million settlement agreement with BofA over its decision to pay billions of dollars in bonuses to former Merrill employees. Bank of America's last-minute decision to purchase the ailing Merrill in September 2008 has remained a central issue in the wake of the financial crisis, prompting both federal and state probes into the matter. Cuomo's office, which has been aggressively pursuing an investigation into the merger and subsequent bonuses paid to former Merrill employees, said it was charging Lewis and Bank of America's former chief financial officer Joe Price with fraud. 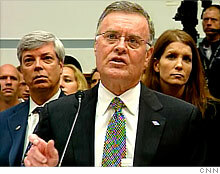 The lawsuit contends that the bank's management team understated the losses at Merrill in order to get shareholders to approve the deal, then subsequently overstated the firm's willingness to terminate the merger to regulators weeks later in order to get $20 billion of additional aid from the federal government. "Bank of America and its officials defrauded the government and the taxpayers at a very difficult and sensitive time," Cuomo said at a press conference Thursday, joined by federal bailout cop Neil Barofsky, whose office aided in the investigation. "I believe that Bank of America officials exploited this fear." A spokesperson for Bank of America called the charges "regrettable" and "totally without merit," adding that both Lewis and Price acted in good faith at all times and were "consistent with their legal and fiduciary obligations." Mary Jo White, an attorney with law firm Debevoise & Plimpton, who is representing Lewis, echoed those remarks, saying her client had been "unfairly vilified" in a search for the culprits of the financial crisis. "This suit is not fair, it is without factual or legal basis, and we look forward to prevailing in a court where the facts and law do matter," White said in a statement. Lewis retired from the company at the end of last year amid intense scrutiny about his role in the merger. Price continues to serve at the bank as the head of the firm's consumer banking and credit card business. Cuomo's office would not say whether the investigation prompted what many believed was an early retirement by Lewis. New York's top lawmaker also said newly-appointed Bank of America CEO Brian Moynihan had no responsibility in the firm's failure to disclose losses before a special shareholder vote in December 2008. "Mr. Moynihan did not have a role in that," said David Markowitz, special deputy attorney general for investor protection, who helped lead the investigation. Despite the charges against Lewis and Price, Bank of America may be one step closer to putting the Merrill bonus controversy behind them as a result of Thursday's proposed settlement with the SEC. The terms of the agreement would require the Charlotte, N.C.-based lender to pay the $150 million penalty to its shareholders who were affected by the disclosure violations. It would also require the company to implement a number of corporate governance changes for the next three years including giving its shareholders an advisory vote, or "say on pay" of its executives. Bank of America would also pay $1 million to the Office of the Attorney General for the State of North Carolina to resolve an investigation it had raised over the merger. The company said the payment is not a penalty or a fine. Bank of America and the SEC were set to square off in court in March over charges that it allegedly lied in its proxy statement, telling shareholders it would not pay out bonuses paid to Merrill employees in fiscal year 2008. The agency brought another nearly identical legal action against BofA in January, alleging that the firm failed to alert investors about the potential losses at Merrill Lynch before the deal closed. The latest settlement would resolve both those charges, but it would still be subject to the approval of U.S. District Court Judge Jed Rakoff. Rakoff scuttled a previous agreement between the two parties last fall, arguing that the original $33 million settlement was not only paltry, but would only impact those who were hurt by the bonus scandal: the company's shareholders. Bank of America (BAC, Fortune 500) shares fell nearly 4% in afternoon trading Thursday.